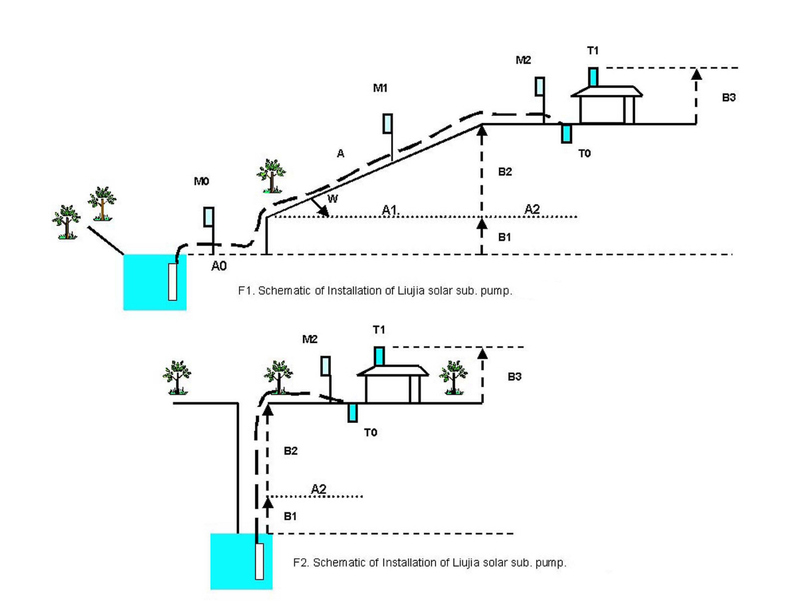 Thank you for your concerns about LIUJIA Solar well pumps . Please tell us your vision, we will do our best to help you select the right pump type. 1. How much water do you need every day, at least and at most in liter? 2. How is the situation of Sunshine at this place? 3. Does the water source contain sediments? If yes, please pay attention to prevent sand from affecting the pump function. 4. How does the planned installation location look like? Fig. 1 or Fig. 2? and Pumping height B1+B2+B3? You can using big solar panel to get more water in bad weather or a place with shadow. But you have to kwon how about if the sunshine become strong and the pump will be run overlaod. Because the piston frequency is proportional to the intensity of the Sun. If the energy of the sun is too strong, the piston motion becomes fast, until the jitter in one position, the output of water is zero. Further, the pump circuit to cause a self-protection, the pump stopped working. After a night, or clouds past, the pump start the next work. The solution in this case, Let solar panels fix up to zenith, deviate from the orbit of the sun. Or use a mesh material covering the solar panel, to reduce the solar energy, such as the protection of the fruit in the tree, to avoid bird damage.